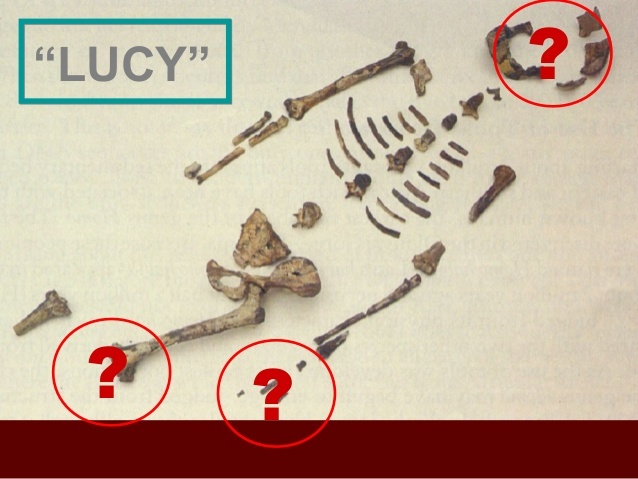 The knee bones were actually discovered about a year earlier than the rest of Lucy. 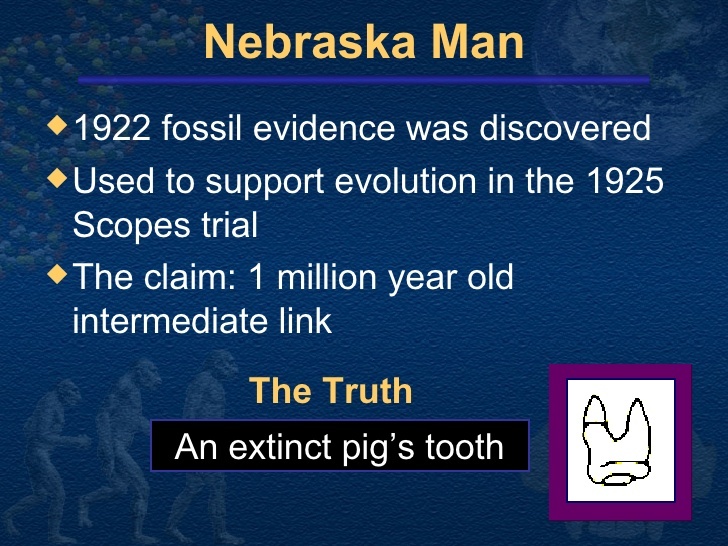 had a chimp-sized brain, chimp-shaped rib cage and jawbone, and arms and legs that indicate it walked like a chimp. 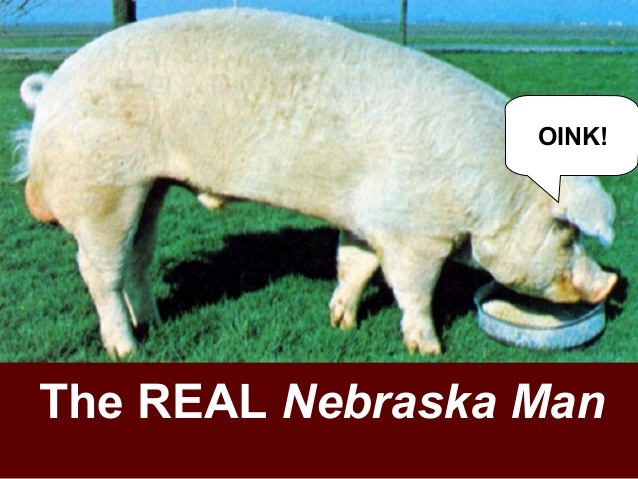 It even had a chimp shaped pelvis. 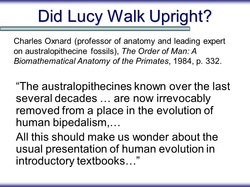 Two world-famous British and American anatomists, Lord Solly Zuckerman and Professor Charles Oxnard concluded separately that Australopithecus specimens were not bipedal but moved in the same manner as modern apes. 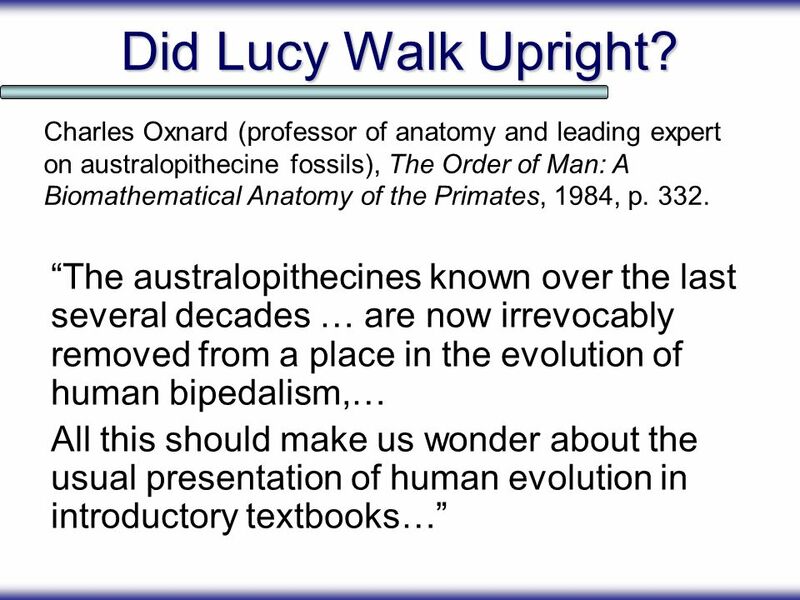 Ref: Donald Johanson: Was Lucy a Hoax?,Problem with Lucy & Skull, Lucy Deceit, Adieu Lucy "Australopithecus could not be considered the ancestor of man, Richard Allan & Tracey Greenwood, Primates and Human Evolution in the textbook: Year 13 Biology 1999. Student Resource and Activity Manual, Biozone International. Printed in New Zealand, p. 260. | Solly Zuckerman, Beyond The Ivory Tower, New York: Toplinger Publications, 1970, pp. 75-94. 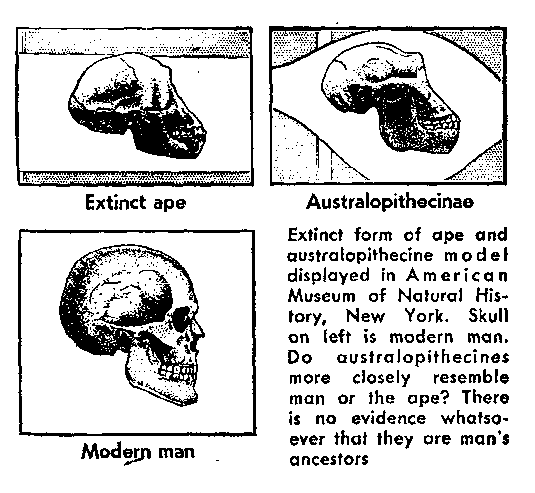 | Charles E. Oxnard, "The Place of Australopithecines in Human Evolution: Grounds for Doubt", Nature, vol. 258, p. 389. 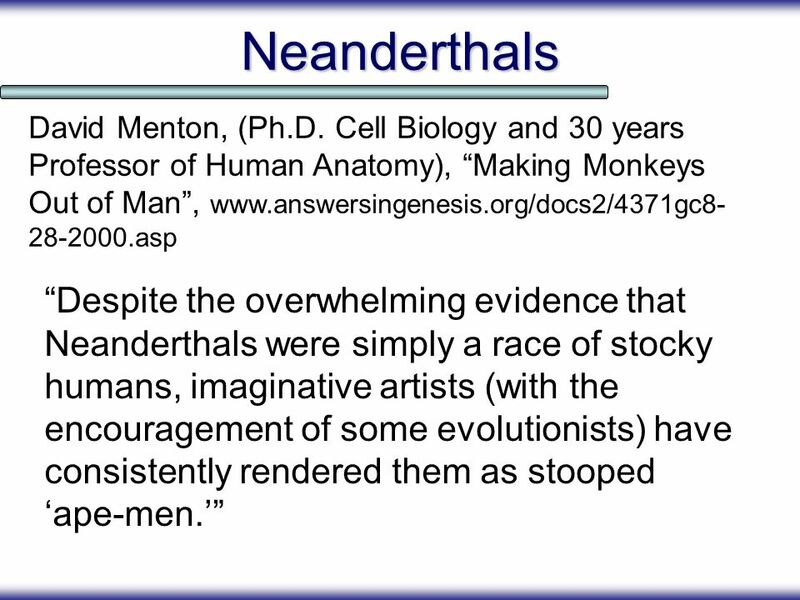 | E. Stokstad, "Hominid ancestors may have knuckle walked," Science 287(5461): 2131, 2000.| Time, Lemonick and Dorfman, p. 61. | Isabelle Bourdial, "Adieu Lucy," Science et Vie, May 1999, no. 980, pp. 52-62. 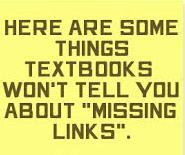 Found in 1922 by Henry Fairfield Osborn, the director of the American Museum of Natural History, this missing link was quickly placed into all textbooks. 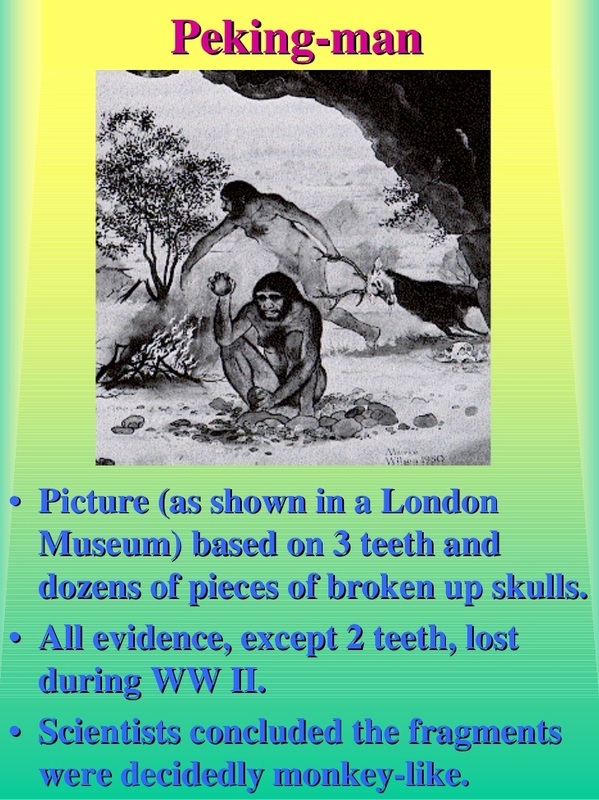 Imaginative drawings in the Illustrated London News gave the impression a complete caveman had been found, when only a tooth had been found. 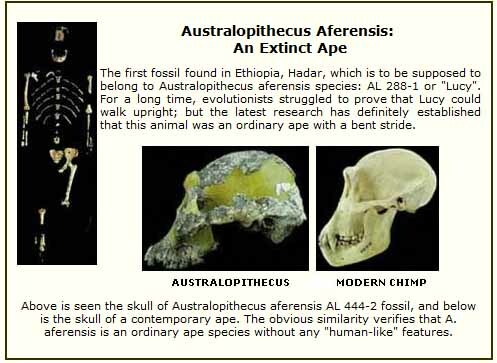 Then all the drawings of Hesperopithecus haroldcooki and his "family" were hurriedly removed from evolutionary literature. 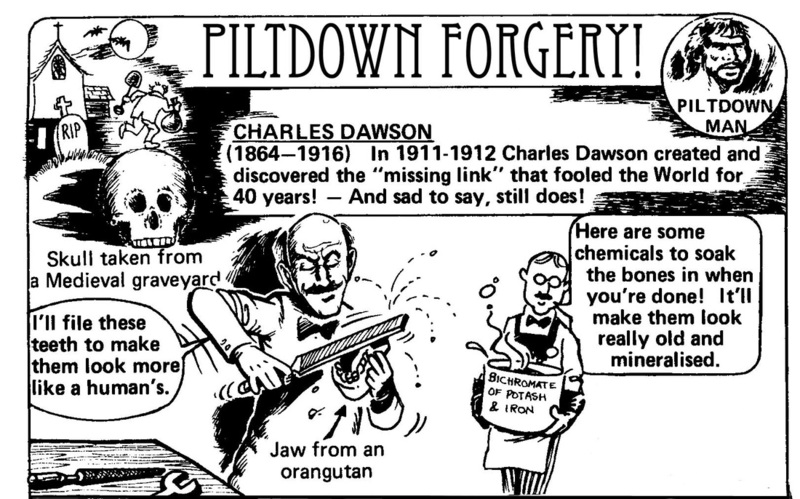 Found in 1912 by Charles Dawson in a gravel pit near Piltdown, England, Piltdown Man was heralded as man's missing link proving man's evolutionary past beyond a shadow of a doubt. 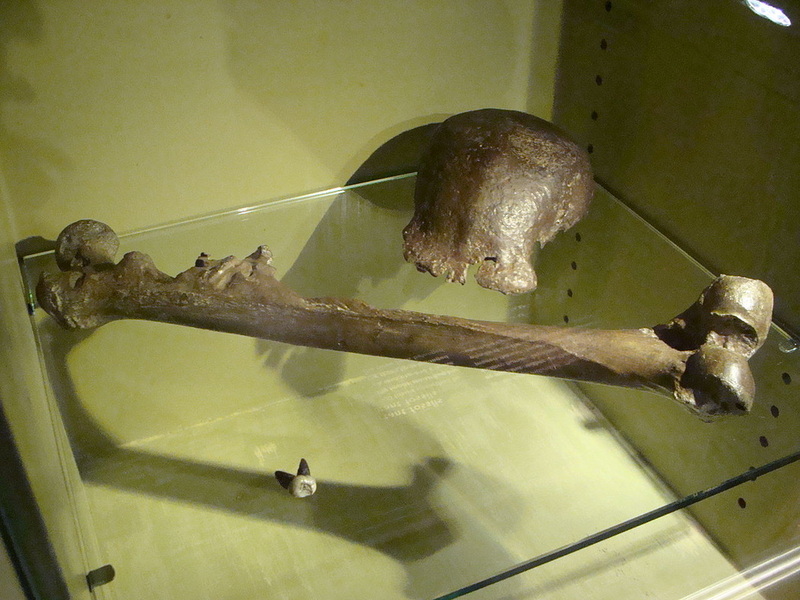 the jawbone had no flourine meaning it remained buried for only a few years. stone tools failed radioactive & fluorine tests for dating meaning they were no older than a few thousand years. 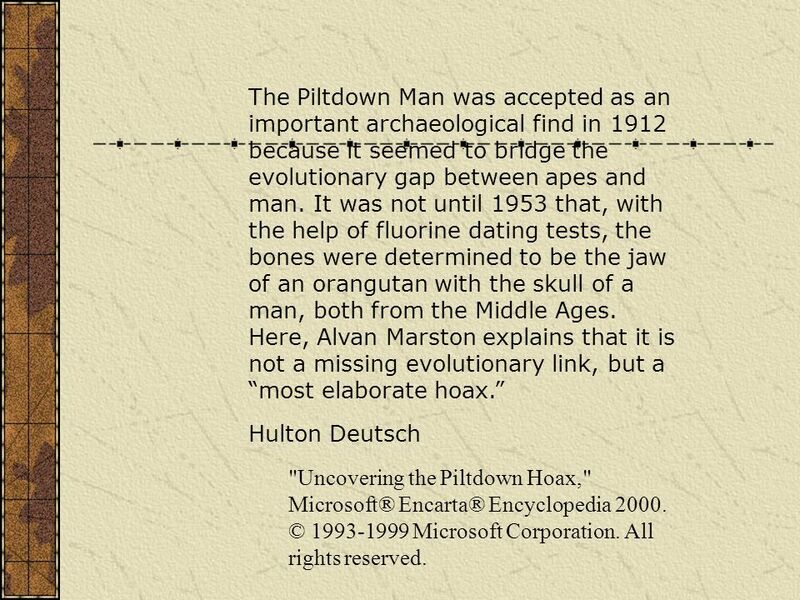 In light of these discoveries the Piltdown Man was quickly removed from display at the British Museum. 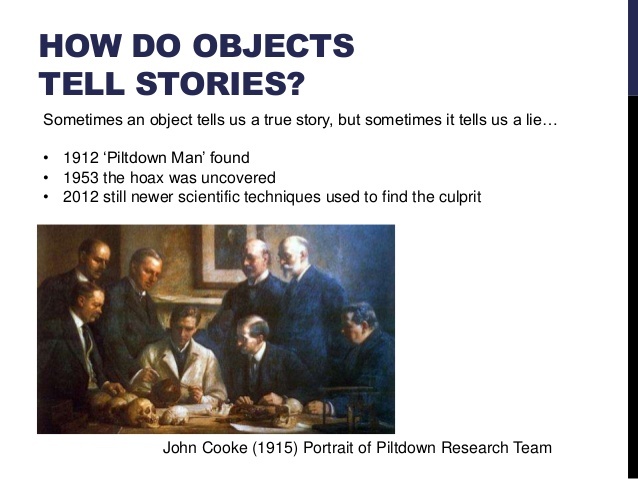 More than five hundred articles and memoirs are said to have been written about Piltdown man. (Nature vol. 274, #4419 (10 July 1954) pp. 61-62). 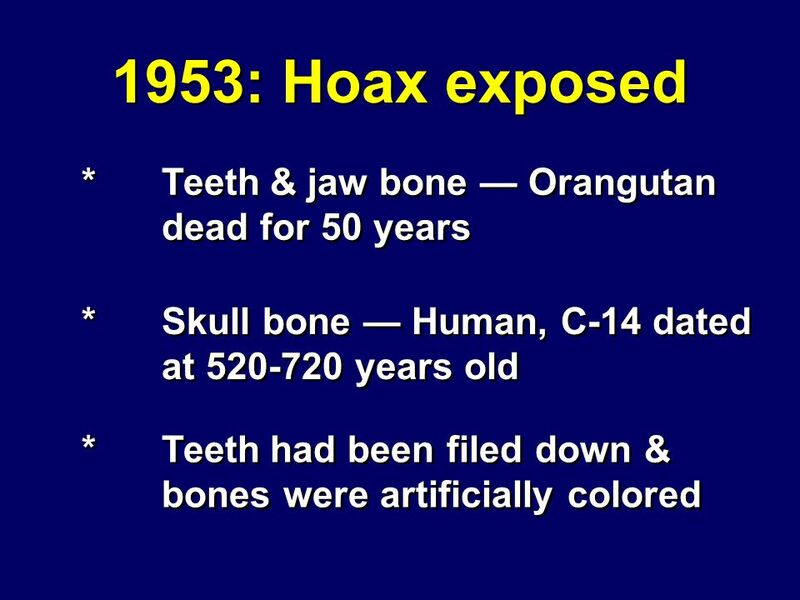 KennethOakely "... radioactive flourine test proved the skull fragments were many thousands of years older than the jaw. 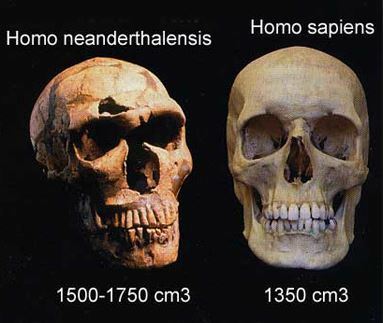 They could not be from the same individual unless, as one scientist put it, `the man died but his jaw lingered on for a few thousand years' " (R. Milner, Encyclopedia of Evolution (1990), p. 363). In 1907, an expedition of German scientists traveled to Java seeking more clues to man’s ancestry in the region of Dubois’ discovery. 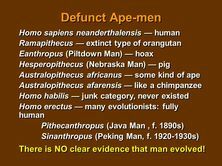 However, no evidence for Pithecanthropus was found. The expedition’s report also noted a nearby volcano that caused periodic flooding in the area. 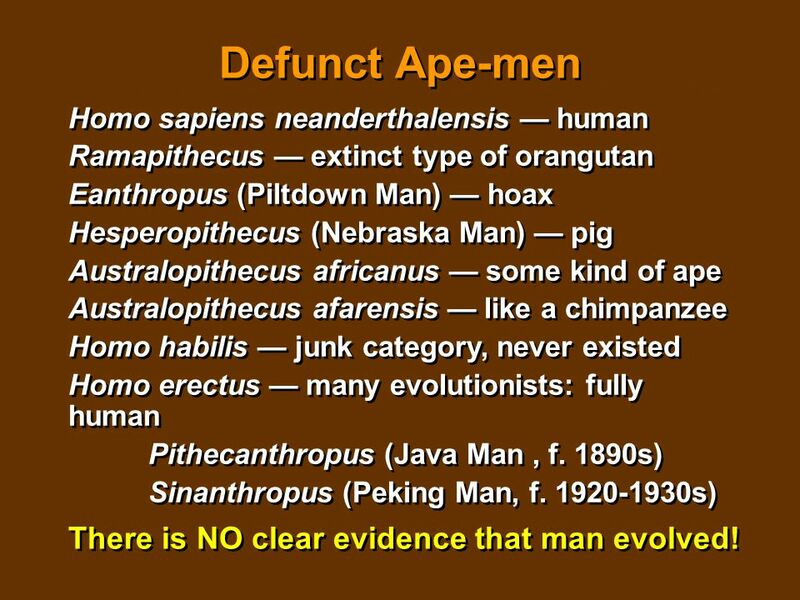 Java Man had been found in volcanic sediments. 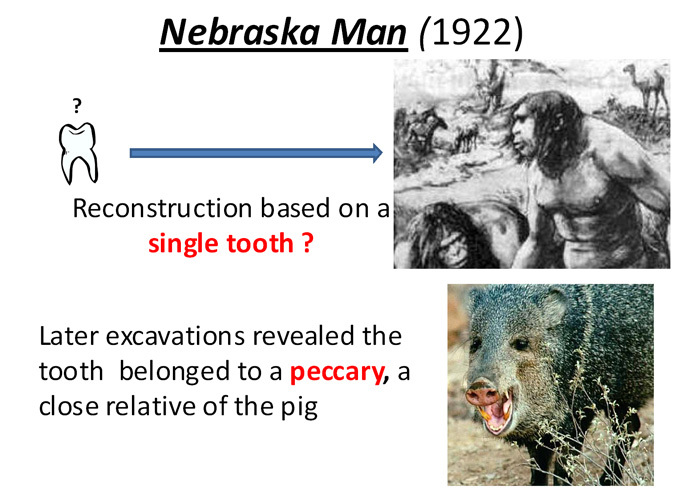 The report observed that the chemical nature of those sediments, not ancient age, probably caused the fossilization of Pithecanthropus. 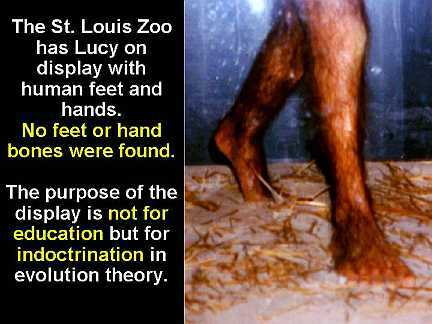 A common practice even today, but largely prohibited, of people in China and Indo-China is eating monkey brains and even gorilla brains where they pop off the skull cap of the monkey or gorilla to eat the brains, as the rest of the gibbon's skin is too tough for consumption. 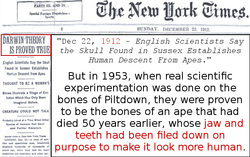 Then there was Peking Man, worked on and validated by a number of Piltdown alumni. 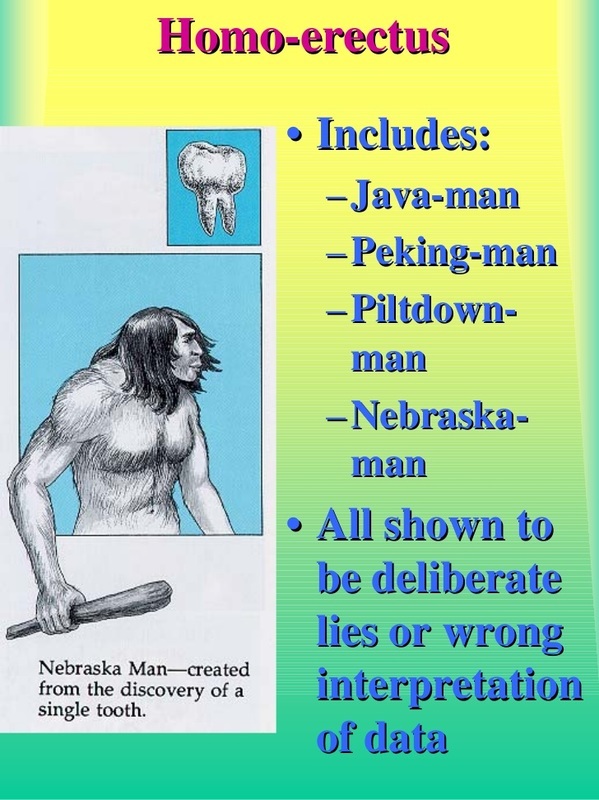 In seeing textbook portrayals of Peking Man, few students learned that the skulls had been found in scattered little fragments, and that the reconstructions were actually composites taken from various individuals. 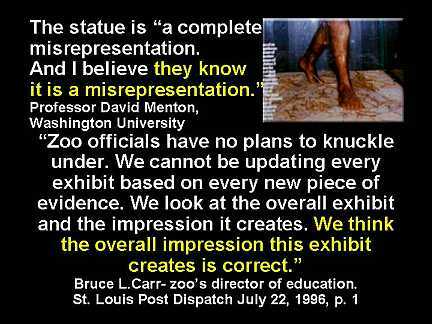 Where fragments were missing, plaster was substituted, and the famous final images of Peking Man were the creations of a sculptress named Lucille Swann. 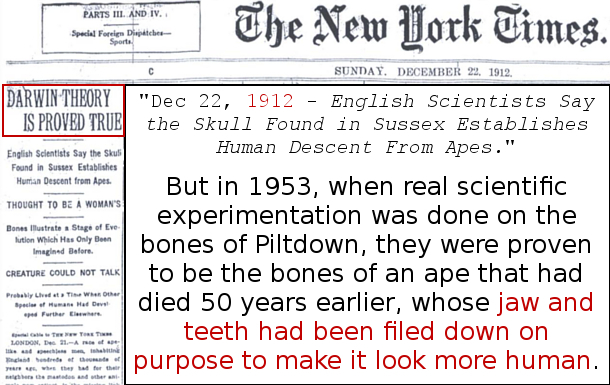 Later, all of the Peking Man fossils mysteriously vanished, except for a couple of teeth, preventing Peking Man from being subjected to the kind of checking that doomed Piltdown Man. 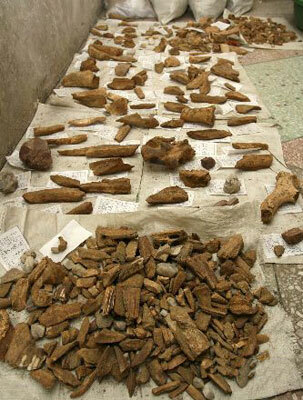 These human bones totaled 14 skulls in varying conditions, 11 jawbones, 147 teeth and a couple small armbones and femur fragments, along with stone tools and carbon ash from fires. Only 6 skull caps were complete enough but all have dissappeared. 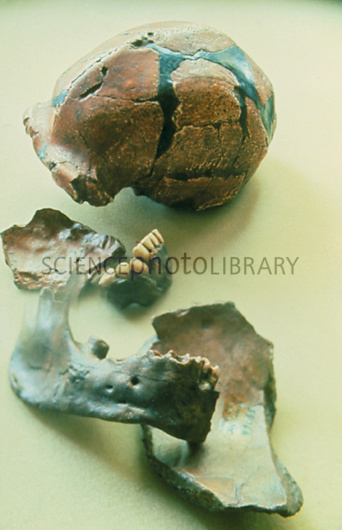 Peking Man skull cap replicas (originals missing). It should be clear by these hoaxes presented as proof of evolution, that scientist are willing to go to extraordinary efforts to deceive us into accepting evolution as a fact, when it clearly is not. 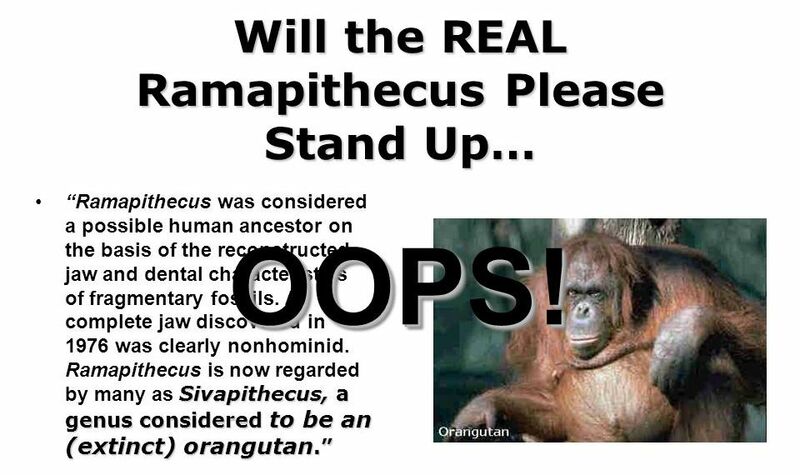 Are these hoaxes more convincing than the Bible? The Bible which has been proven 100% true in Science, Medicine, History & Archaelogy, and Prophecy, says we were CREATED by a supernatural, all powerful God in an instant, with no gradual changes necessary. Will you trust? 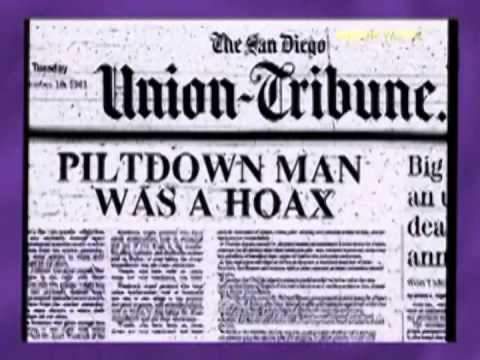 These MANMADE HOAXES or the God of the Bible who says He created you and loves you so much that He sent His Son, Jesus, to die for your sins and make you right with God so you can go to Heaven. If you want to trust the God who created the universe and everything in it, all you have to do is accept Jesus by believing in Him and calling upon Him to save you. Won't you do it today?